As the 29 Democratic presidential candidates fan out across our state, operatives and journalists are taking note of one of our notable quirks: our bad habit of mismatching city names and county names. It starts at the top. Our capital, Des Moines, is in mid-state, while Des Moines County is on the Mississippi River. The city of Keokuk is also on the Mississippi, but Keokuk County is about three counties northwest. Cedar Rapids is not in Cedar County, Iowa City is not in Iowa County, the list seems endless. There are so many mismatches that I wondered if it was possible to draw a RAGBRAI route that successfully avoided all places that have mismatched names. After wasting a bunch of time I determined: Yes, it is, just barely and with a couple asterisks. 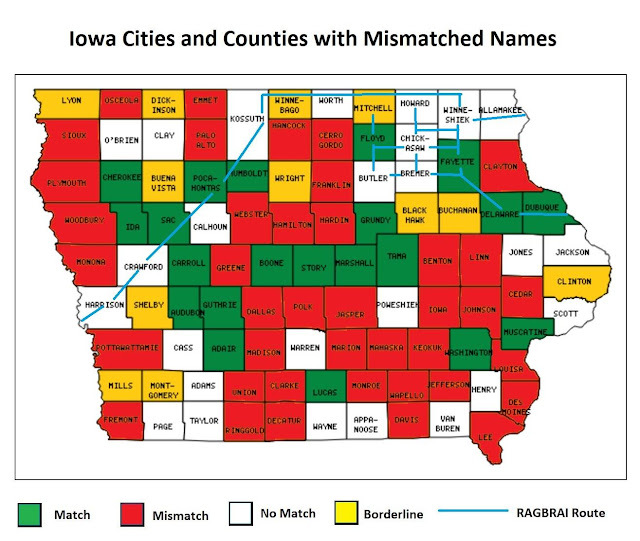 In the map above, "Match" means a city in the county with the same name, with no other mismatches. Washington is in Washington County. A mismatch is when a city is in a county with a different name. This disqualifies BOTH counties. Des Moines is not in Des Moines County, which makes both Polk County and Des Moines county a mismatch. Borderline cases involve name variations or unincorporated, little known places. And there are some counties with no matches at all. Once you get through that one county corridor along the Minnesota border, you have several options in northeast Iowa. For a slightly shorter route, stay along the northern border all the way to Allamakee County and finish in Lansing or New Albin. If you want to finish in Dubuque, just make sure you pass your bike tires through a quadripoint where Fayette and Delaware counties meet (or, if you lean slightly to the right into Buchanan, you can opt to ignore the unincorporated town of that name in Cedar County). If you've made it this far, you probably want to see my work. Someone else is welcome to do the pronunciation guide. Buchanan - Borderline. Unincorporated town of Buchanan in Cedar County. Cedar - Cedar Rapids is in bordering Linn County. Almost a borderline name-variation case but Cedar Rapids is both big enough and close enough for confusion. Cherokee - Cherokee is in Cherokee County. Clay - no city with this name. Ignoring Clay/Clayton county confusion. Clayton - the city of Clayton is in Clayton County, but they fail because the city of Monona is not in Monona County. There's also unincorporated Hardin here and not in Hardin County. Clinton - Borderline and a tough call. The city of Clinton is here of course, but so are the unincorporated towns of Buena Vista and Lyons. Dallas - Melcher-Dallas (formerly two cities, Melcher and Dallas) is in Marion County. Des Moines - City of Des Moines is in Polk County. Dickinson - Borderline. Unincorporated Montgomery is in Dickinson County. Fayette - Fayette is in Fayette County. Hancock - city of Hancock is in Pottawattamie County. Hardin - City of Union not in Union County. Iowa Falls not in Iowa County. Unincorporated town of Hardin is in Clayton County. Harrison - no city with this name. Humboldt - Humboldt is in Humboldt County. Jasper - Even if you ignore the Mitchell/Mitchellville issue, the city of Monroe is here and not in Monroe County. Louisa - Wapello not in Wapello County. Lucas - city of Lucas is in Lucas County. Lyon - Borderline. Unincorporated Lyons is in Clinton County. Marion - city of Marion is in Linn County; Melcher-Dallas not in Dallas County. Marshall - Marshalltown is in Marshall County. Mills - Borderline. Lake Mills is in Winnebago County. Mitchell - Borderline. Mitchell is in Mitchell County but Mitchellville is in Jasper County. I'm inclined to give them a break here, especially since they are key to the RAGBRAI route. Monona - city of Monona in Clayton County. Monroe - city of Monroe in Jasper County. Montgomery- Borderline. Unincorporated Montgomery is in Dickinson County. Palo Alto - Emmetsburg not in Emmet County. Plymouth - city of Plymouth is in Cerro Gordo County. Pocahontas - Pocahontas is in Pocahontas County. Poweshiek - no city with this name. Scott - The biggest county with no mismatch. Iowa has no city named Scott or any variation of Scott or Scot, they don't have so much as a township sharing a name with another county, and I'm not penalizing them for unincorporated Scotch Grove in Jones County. Shelby - City of Shelby is in both Shelby and Pottawattamie Counties. Unincorporated Jacksonville not in Jackson County. Sioux - Sioux City is in Woodbury County, though Sioux Center IS in Sioux County. Story - Story City is in Story County. Union - city of Union is in Hardin County. Wapello - city of Wapello is in Louisa County. Winnebago - Borderline. Lake Mills not in Mills County. Wright - Borderline. Unincorporated town of Wright in Mahaska County. 1) I'm going to take a risk here and say what I really think about Israel and Palestine. 2) What follows would have been unthinkable to say in public in America even 2 months ago. (Israel itself allows more debate.) The discussion has been one sided far too long. It should go without saying that I respect everyone's heritage and faith - but I have to say it anyway. 3) First off I think people should be able to live where they want and migrate as they need. I'm idealistic enough to be a Statue of Liberty literalist: the core principle of America is that we are a multi-cultural nation and the universal land of refuge. 4) We did not live up to these principles in 1933 or 1945, and we are not living up to them now. But these principles should be fought for, not abandoned, because they are at the core of what makes us American. 5) Aside: Our own hands are not clean. Neither America or Israel was "a land without a people for a people without a land." We can't ignore that our "universal refuge" was founded on African slavery and on the extermination of the Native Americans. 6) But we are what we are now, and while efforts are important, not every human tragedy can be fully atoned for or repaired. Trying to fix one tragedy can create others. Keep that concept in mind. 7) I also believe that nation-states should be secular and not sectarian, & multi-cultural and not ethnic or nationalist based. So I oppose the "right to exist" (sic) of Israel *as currently constituted and organized*. The status quo is immoral, unsustainable, & cannot continue. 8) I am an anti-Zionist because Zionism a) rejects America as land of universal refuge and 2) creates a colonial-immigrant state explicitly based on religion and ethnicity. 9) I believe the creation of Israel in the British Palestine mandate was the greatest foreign policy mistake of the whole postwar era - greater than Vietnam. We addressed one human rights tragedy, the Holocaust, with another - the displacement of the Palestinians. 10) Rather than backing a specifically Jewish state in 1948, America should have accepted the Jewish refugee population in 1945 - or, better, in 1933. 11) But if there WAS to have been a Jewish state it should have been created in the region where most of the refugees and survivors came from - eastern Europe, where vast populations were already displaced and depopulated in the aftermath of the war. Basically, in East Germany. 13) Finally getting to the point here. My preference is for a one person one vote secular & multicultural state that treats Jews, Muslims, Christians, and all others as equal citizens. The problem is, I doubt most of the people who live in the Holy Land actually want that. 14) It's been clear for many years now that the Netanyahu-Likud plan is to make the entire region between the Mediterranean and the Jordan and Dead Sea an exclusively Jewish state, one settlement at a time, with the Palestinians expected to simply go elsewhere. 15) The Israeli opposition is more open to negotiation, but not on equitable enough terms. (Israel is now in election season.) There are Palestinians who will accept anything they can get, and there are others who want nothing less than a full Jewish exodus. 16) So, sadly, there probably needs to be some sort of two state solution. The tragedy of a two state solution for two peoples so intertwined is that inevitable some people will end up on the "wrong" side of the line. See the India-Pakistan partition for bloody details. 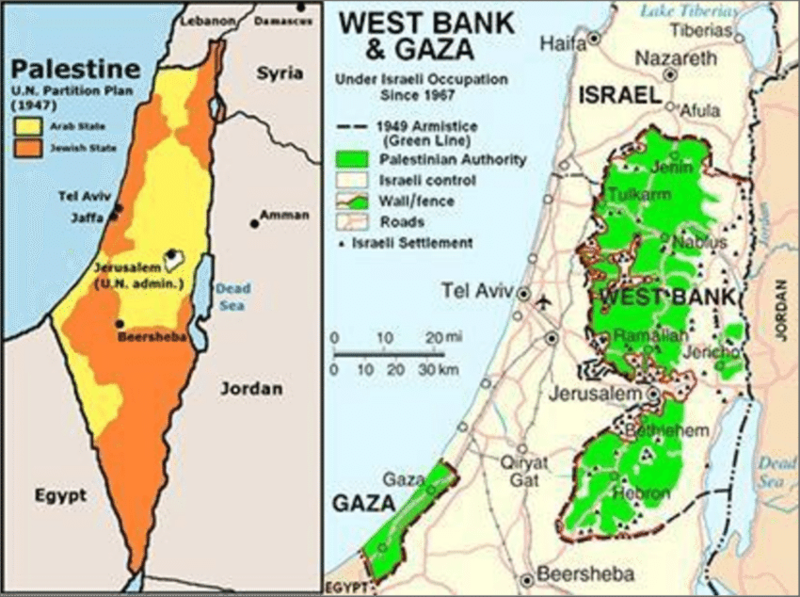 17) If there are to be two states, they need to be more equitable than the 1967 cease fire lines which heavily favor Israel. The basis of discussion should be the original 1947 UN partition plan: 2 states made up of 3 parts meeting at points, with a Jerusalem international zone. 18) Both sides will have to give up a lot: their claims and "rights of return" on the other half, and Jerusalem as a capital. There will need to be compensation to families who lost homes - and in exchange they will need to give up claims on those homes. 19) There will need to be significant disarmament on both sides, including Israel's nuclear weapons. Both sides will have to rein in their extremists, which is easier said than done. 20) Many people will find their homes on the "wrong" side of the line, and their rights and safety must be protected whether they stay or move - again on the principle that people should be able to live where they wish. And any who choose to move should be welcomed in America. 22) I an pessimistic and don't see how discussion can get to this point. America might not be the best broker for this discussion. And the hatred in the Middle East may be so great that even this might not work. But it's safe to say *nothing short of this* will work. One provision that seems targeted straight at the Peoples Republic: no satellite voting in state owned buildings. With no sites at UIHC and the IMU the lines will be longer for everyone everywhere else. So it's OK for a student at Dordt or Luther to vote early on campus, but not at UI ISU UNI or the community colleges? 2016 in Johnson County: 2004 voters at IMU, 2016 (not a typo) at UIHC, and 309 at other campus sites. All those sites banned under proposed bill. All those voters added to lines at other voting sites - or maybe, and that's the idea, not voting at all. Cross references are always my weak point reading legislation but at first look it seems this bill could make voters inactive simply for not responding to a mailing, rather than current law which only activates if USPS returns mail as undeliverable. Step 1: send a card in January, and immediately make them inactive. Step 2: send another scary notice in April. One provision targets student specifically and maybe illegally: University has to send a mailing at graduation that in effect encourages them to cancel registration. No other group is targeted the same way. Signature requirements would increase for independent candidates running in general elections - perhaps because Axne beat Young with under 50% in a six way race? 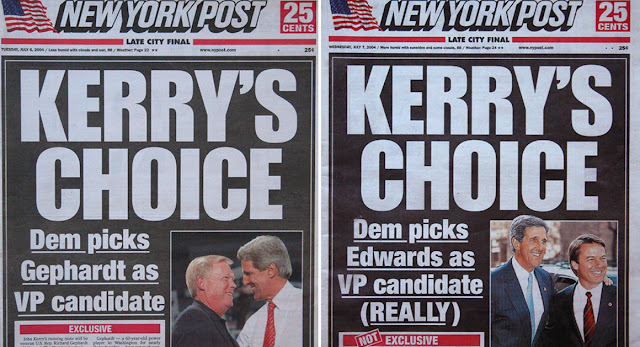 Chris Andringa: @cjandringa Is this really stating that *any* tied election gets a special (pp. 27-28)? Hello, township trustee special elections! A runoff may be better than drawing a name for a legislative seat, but people have no idea how many township trustee elections are tied with two write in votes each. Would definitely need to be an exception for that. Under current law there are no provisions at all for a township special election. All vacancies are filled by appointment till the next general election - which has not been a crisis. Biggest problem is usually finding someone willing to do the job. Bill would change close to 8 for all elections. Would also change registered deadline to 10 days for all elections. Currently 10 for general 11 for all others. The consistency and extra day for registration deadline is good, but that's a Saturday. Will auditors have to be open Saturday for a reg deadline for a special election in their smallest city? Pages and pages devoted to Roby Smith's pet peeve: auditor's discretion in which order parties are listed. Also changes auditor's signature on ballot to a county seal. Reasonable minds can disagree, but IMHO it's petty. About the only thing I do like (and reasonable minds disagree) is a "sore loser" law that would keep primary losers from running as indys in the general election. I have always believed that if you buy into a nomination process you should accept the outcome and not get a do-over. Can't wait to hear Roby Smith's "official" reasons for some of these items (we all know the real reasons). Should be even sillier than his "no one should vote before a debate" rationale for dropping 11 days of early voting, or his technically impossible 2017 ballot rotation plan. Questioning the motives of American Christian conservatives who only support Israel because they think it means Jesus Is Coming Soon? Not anti-Semitic. Likening Israeli policy to apartheid South Africa because the shoe fits? Not anti-Semitic. Arguing for our right to use our dollars as we wish and boycott businesses that support governments with bad policies? Not anti-Semitic. Questioning why Iran has to get rid of nukes and Israel gets to keep them? Not anti-Semitic. 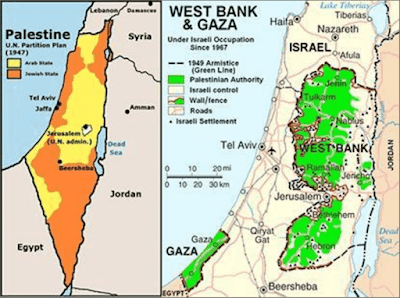 Arguing for a two state solution starting from 1947 U.N. agreement lines and not from 1967 ceasefire lines? Not anti-Semitic. Questioning the premise of Zionism that there HAS to be a specifically Jewish state, and arguing instead for a one person one vote equal secular state, the way we did in South Africa? Not anti-Semitic. All these issues and more are legitimate subjects for debate but are silenced by the anti-Semitic card.